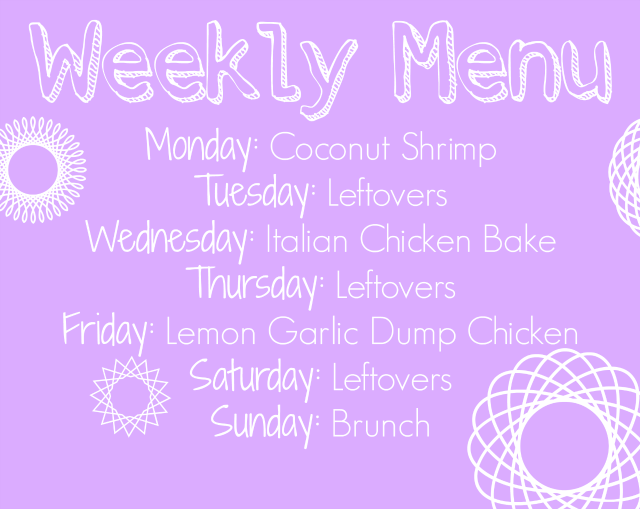 It's weekly menu time! Time to write down that plan and get to the grocery store. Not only does menu planning help me stay on track, it also saves money. I make a list of our meals for the week and then also write down all the ingredients I will need to buy. Then, when I am at the grocery store - I know exactly what I need to buy and don't end up just wandering and dumping things I don't need in my cart! I also have learned to build leftovers into my menu. Who wants to cook every night? If I don't have enough for leftovers - I'll send them with my husband for lunch and have a quick dinner back up for the next night (eggs, rice & beans, etc). So what's on the menu this week? Coconut Shrimp - YUM! I am going to use whole wheat flour on this. I'm excited to try out this recipe. I'll probably serve it with brown rice and broccoli. Italian Chicken Bake - You just can't beat a recipe with only 4 ingredients! After a day of work, I am all about simple. Not only does this look easy - it also looks delicious! Lemon Garlic Dump Chicken - this is a meal from our Freezer Meal Swap. I made this one and am excited to try it out! I'll probably serve it with salad and maybe a fruit salad for dessert. Brunch - Breakfast is just an easy thing to make for a big family meal. It's also easy to please everyone! This will vary - fruit, oatmeal, eggs, etc. It's day 22 of clean eating! You can check out my guidelines here. I am going to just be transparent and say that this week has been my hardest week! I'm not sure why - I was just hungry. I may have enjoyed some Starbuck's the other night and some pizza last night. Overall - I have really done well! I haven't really strayed from my menu except for 1 night. I feel like healthy eating has become a habit again. When I did indulge, I really wasn't able to eat very much of it. I don't think it's realistic to deprive myself forever - otherwise, I'll obsess over it until I get it. If someone says - you can never have pizza, what do you want? Pizza! I just have to be careful not to let my 1 splurge meal turn into a splurge day, weekend, week, etc. 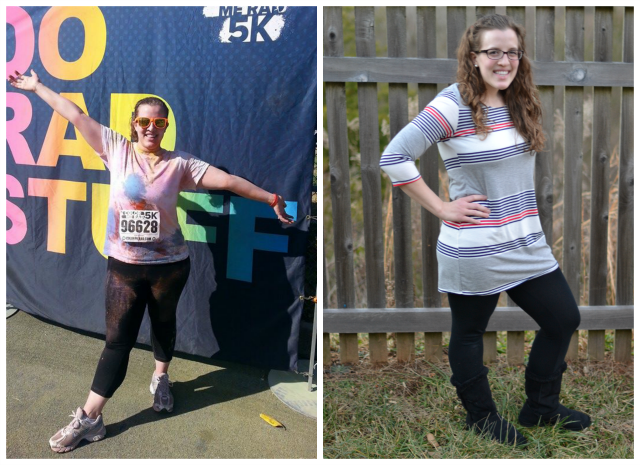 I earned my next prize envelope and have now lost a total of 31.8lbs! I got an e-mail yesterday saying my Stitch Fix is in the mail - I can't wait to see what I get! It always feels good to get new clothes - it feels even better when you feel good in them. Activity! 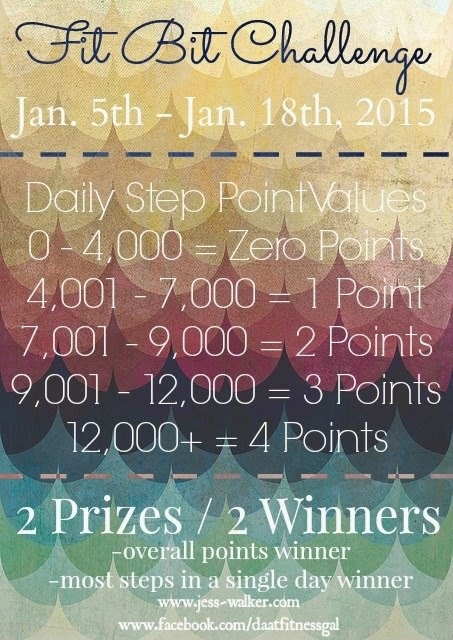 Update on the FitBit Challenge - I won the most steps in 1 day - 25,661, and tied for overall points winner! Woo hoo! A little healthy competition really got me moving! I am considering hosting my own challenge! If there are any FitBit friends out there who are interested - let me know! I have been a little under the weather for a few days - so my activity has been a little low. Hopefully this will pass quickly and I'll be back at it next week!